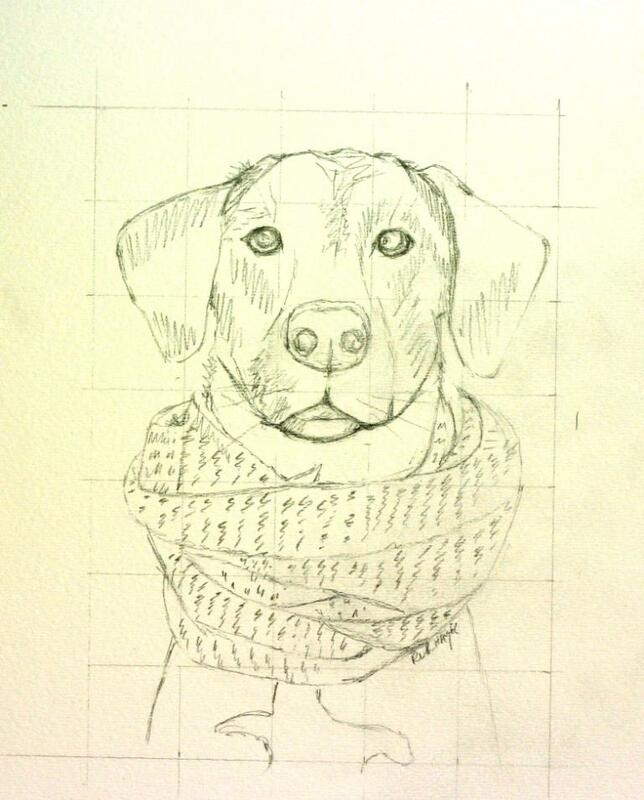 I worked mostly on the dog portrait this week. I fiddled around for a long time on the pencil up because the pictures were not the clearest, but I think it turned out well. Black portraiture is so hard for me. Too little of the black and the subject looks grey. Too much and it’s all shadows and little delineation. Consequently, I was hesitant to start with the watercoloring. I am sure glad that I did those black cat portraits a few months ago. Finally, I just dove in. Fortunately, the picture had the added interest of the scarf to lighten all of that black. She said it was one of her favorite pictures and I can see why. I do use a small grid for the pencil up accuracy and then do most of the inking with a loose, light touch. When I am satisfied that there is enough delineation, I remove the grid so I can see the photo better and I erase the pencil guidelines. I rapidly add the watercolors, mostly daubing splotches here and there until I am satisfied that the essence of the animal is there. I don’t want to over do it and suddenly make it into a photo like representation. I’m not good enough for that. Light and loose seems to work the best for me in this case. Next up is the office building. She finally got back with a few more photos and details and I am inking it up now. Amongst everything else that is going on, I have managed to pencil up the two commissions. The dog was especially hard because for some reason the file size only showed 2 kb when I saved it to my computer. The photo seemed big enough on the screen, but would only save as the small file. I am wondering if there is some technical reason, such as reducing the size for stopping image theft. Anyway, that, along with the black animal photo difficulties, have made it a rather longer process than usual. She sent me several pictures and ended deciding she like the one with her dog wrapped in a scarf. I must admit it is a cute photo. I just wish the quality had been better. It is so much easier to work from a good photo where I don’t have to guess. The architectural commission is of medical office building. I had the same difficulty of file size but we managed to work it out. When I do the pencil up, often I have questions that are not apparent initially. Our minds fill in the details of a photo but when I need them for the work, they are not there. She was able to take the extra photos that I needed. It’s been a heck of a week. Not only did we get Alex the dog, but I got commissions for a dog portrait and an architectural of an office building as well as selling 2 of my shore bird linocuts. I can see myself coming and going lately. I have the architectural mostly pencilled up but can’t really start the inking because some of the detail photos are too small and I can’t print them. I’m waiting for her to retake some of them. I will start the pet portrait soon. Those file are small too so I’m waiting to see if she has a larger version of one. Alex is doing well. He is almost housebroken, although I wouldn’t trust him quite yet. He is sleeping mostly through the night in his crate and we are taking daily walks up and down the drive for exercise. Two trips up and down are over a mile. I do it twice daily, once for the paper and once for the mail. 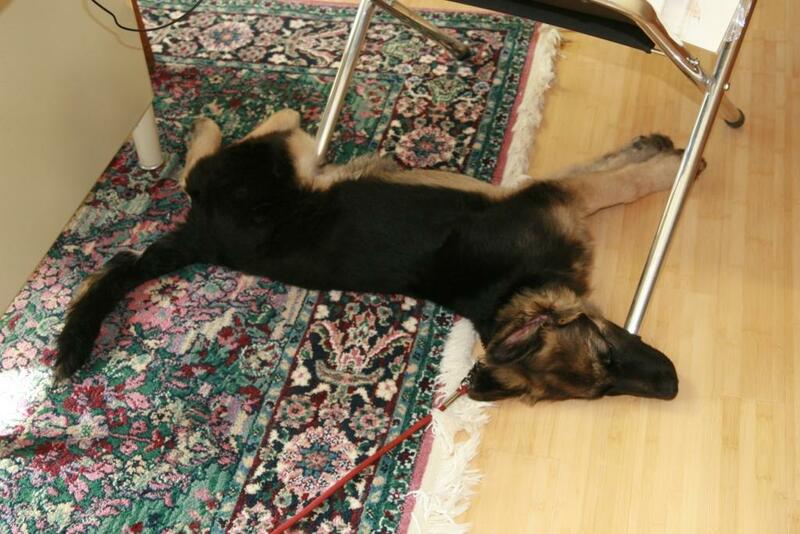 That, including some fetch with a ball and frisbee, seem to tire him out enough right now. He is so funny at times. He likes to carry his plush Winnie the Pooh and try to to pick up his ball at the same time. Occasionally he can do it but usually he just ends up kicking the ball around and chasing it, still holding on to Winnie. He and I had a day excursion today. My friend and riding teacher invited Alex and me to go along for her lessons so he could get some socialization. We live out in the country and don’t have the opportunity unless we make it. I am happy to say he behaved quite well – far better than I had expected. He played with a corgi who told him what for, learned to behave a bit better with cats, and rode quietly in the vehicle. All in all it’s been a good week. I’ll post some of the commission work next time around. On Monday, the day didn’t go quite as planned, but in a good way for a change. I started the day out dogless and ended up with a new member of the household. When we came back from an appointment about noon, he was hiding around a trash can at the base of the driveway and by the end of the day he was in our house. 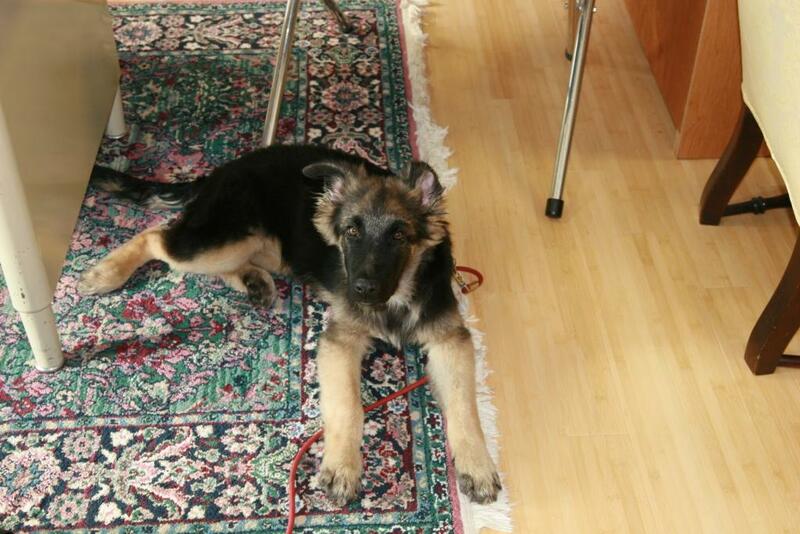 He appears to be about 4 months old and is smart as a whip. He knocked down the baby gate we are using to keep him occasionally enclosed in the laundry area once and after that he has respected it. After one evening, he will willingly go into his crate when he is told to. He learned to fetch his ball and give it to me in less than 10 minutes, once he figured out I would throw it again for him. One or two noes have been enough to keep him away from things I don’t want him in, although I don’t quite trust that in such a young dog. 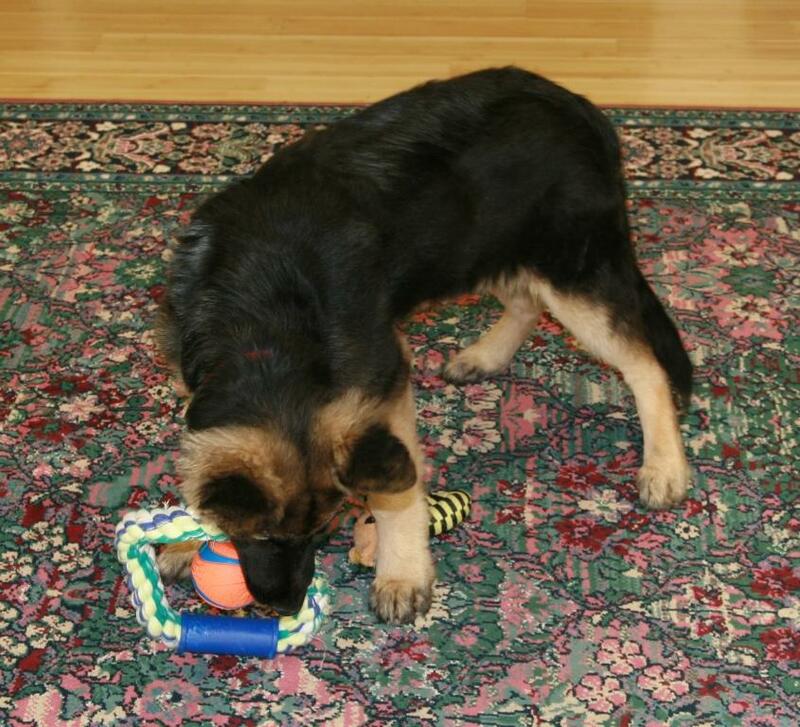 He is going to be a big one – far larger than any dog I had thought to get, so he needs to be very well behaved. We have asked around and no one has claimed him. Here’s to hoping he can stay. 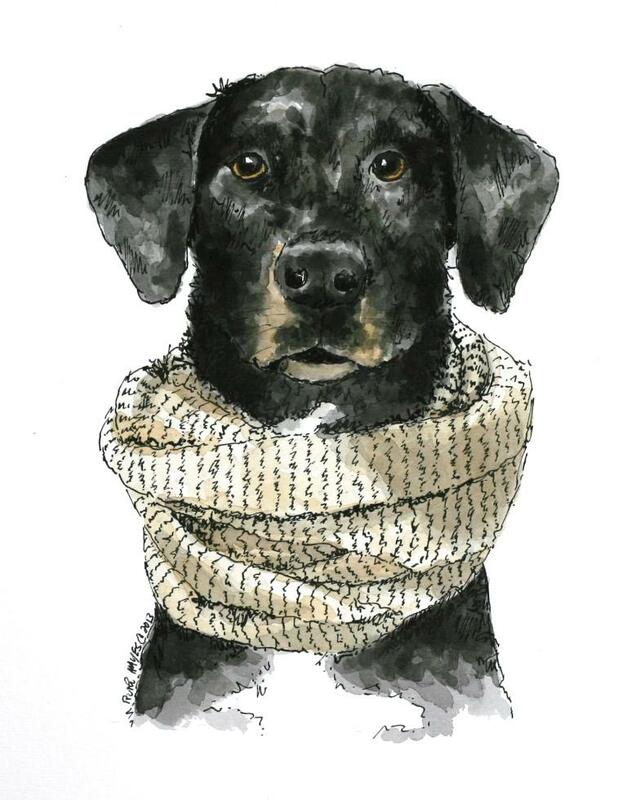 And I think another dog portrait may be in order. I have had a very hard time with this watercolor and that is probably a good thing. The first day I put on the color it turned out to be way too bland. I let it sit overnight and the verdict was the same. I decided to just get bold and get on with it. 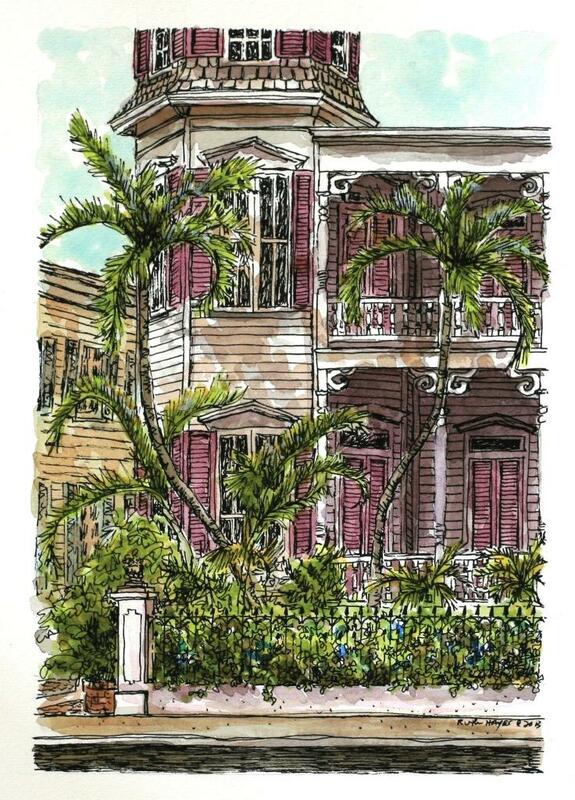 Key West houses are just not blah. I slapped on more of the pinkish/lavender onto the shutters and added some to the shadows on the porches. I added more depth to the foliage and put in some white highlights. I used muted colors for the side street house, but not too muted. I have added a bit more ink to redefine certain areas of the trees. I am trying to use looser, less deliberate brushwork so I don’t over think it – always a problem for me. Lately, I have been thinking about this art journey I’ve been on. In the last three years of blogging, I have worked on more projects than I off hand can count. And do you know what? I think I actually have improved some. It occurred to me after I finished the last two pet portraits that I felt pretty good about them. A few years ago I felt that my animal work had lost its vitality and was depressed about it. Now, I am l happy to work on them again. 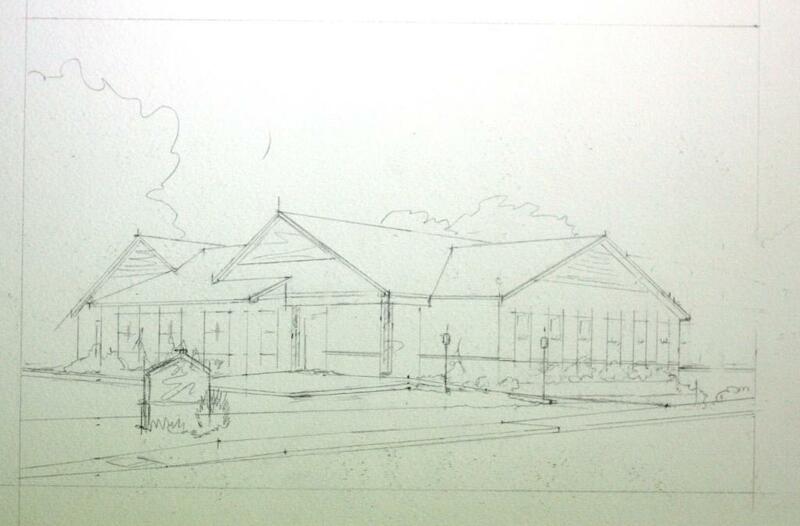 I do have a degree of confidence in the ink/pastel architecture work. I have been doing them for going on 30 years now so I hope they are somewhat respectable. LOL I wish I could find the very first things I did for my husband’s building company, but they are long gone. They were truly awful, but part of my learning process. I do think that the abstract streetscapes have helped free up my technique and the current watercolors seem to be moving in the right direction. Who knows where I’ll go next. Thoughts, anyone? Once again, I have been forced to endure the folly of the time change. I sure miss the years when Indiana sat it out. I just see no reason for it these days. Anyway, after the last watercolor architectural, I wanted to try another smallish one. I thought it had turned out fairly well, so I upped the size a bit and went from there. I’m going to sneak up on the 14×10 my client wants in the spring. I have lots of pictures from a trip to Key West. 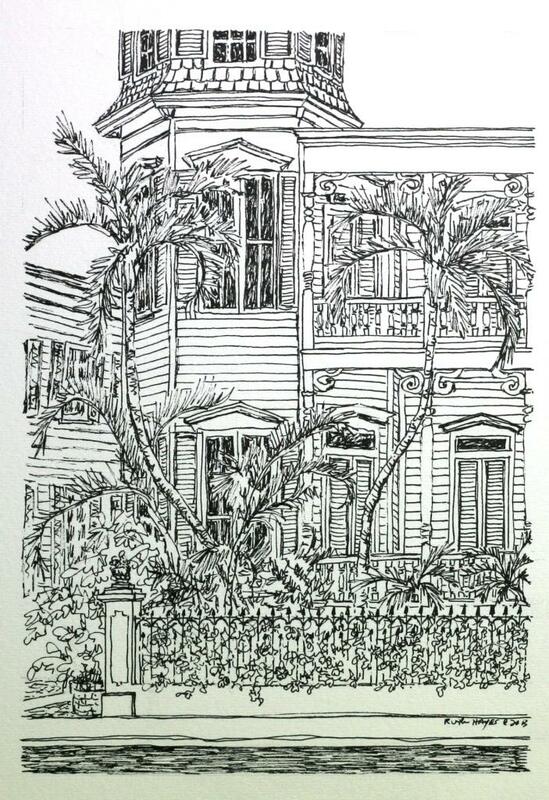 Florida, years ago and I sorted through them, looking for interesting house shapes and foliage. I like the vibrant colors mixed with the semi-tropical landscaping. This one had some of the most bent palm trees I have ever seen. They almost seemed to be dancing in the yard. The shutters of the house are on the pinkish side against gray clapboards. There wasn’t much in the way of flowers, but I may decided to put in a few more. How much color I’ll add will depend on how I like the way the house turns out. The shutters are pretty loud in and of themselves and I want to have some cohesion in the picture.